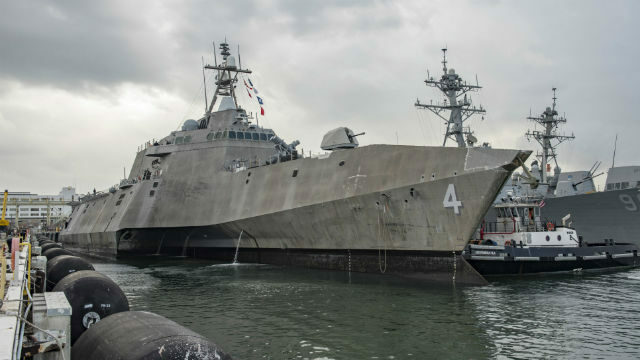 The trimaran-hull littoral combat ship USS Coronado departed Hawaii on Thursday to continue its 16-month deployment after repairs to its propulsion system. The San Diego-based Coronado and other ships in the Navy’s littoral program have experienced breakdowns at sea, prompting the Navy to announce changes in training and support for the new class of vessels. Plans call for 52 of the fast, flexible ships in two variants, trimaran and monohull, but the breakdowns have put the program under scrutiny. The Coronado’s departure followed a brief maintenance period and sea trials to check repairs to two high-speed, flexible couplings in the ship’s propulsion system. The couplings failed Aug. 29 while Coronado was en route to Singapore. The Coronado returned to Hawaii under its own power for repairs. The Navy said the problem was a “material deficiency,” not human error. The USS Independence experienced a similar problem earlier this year.